This example shows how to take into account model uncertainty when tuning a motion control system. 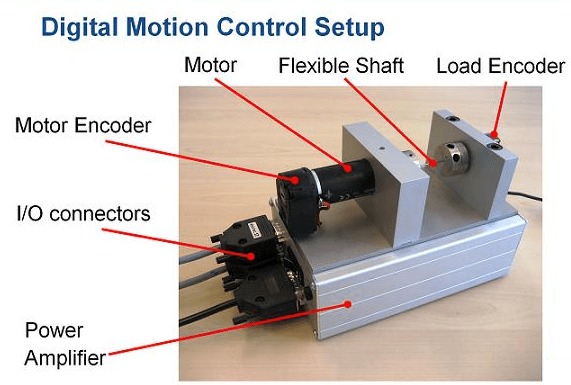 This example refines the design discussed in the "Tuning of a Digital Motion Control System" example. The positioning system under consideration is shown below. In the earlier example, we tuned the controller using "crisp" values for the physical parameters . In reality, these parameter values are only known approximately and may vary over time. 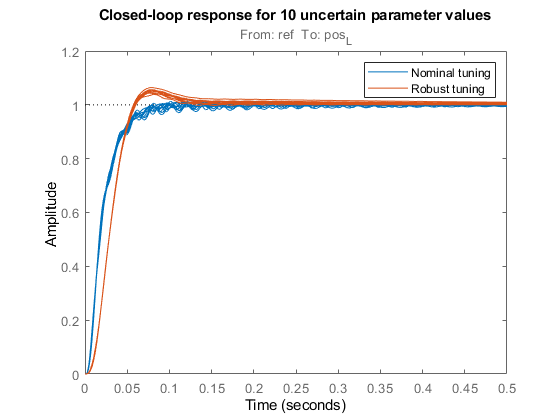 Because the resulting model discrepancies can adversely affect controller performance, we need to account for parameter uncertainty during tuning to ensure robust performance over the range of possible parameter values. This process is called robust tuning. Assume 25% uncertainty on the value of the stiffness , and 50% uncertainty on the values of the damping coefficients . Use the ureal object to model these uncertainty ranges. Uncertain continuous-time state-space model with 1 outputs, 1 inputs, 4 states. Type "G.NominalValue" to see the nominal value, "get(G)" to see all properties, and "G.Uncertainty" to interact with the uncertain elements. Note that the resulting model G depends on the uncertain parameters . To assess how uncertainty impacts the plant, plot its Bode response for different values of . 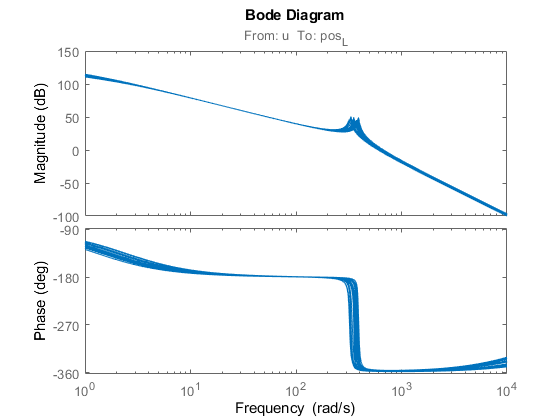 By default, the bode function uses 20 randomly selected values in the uncertainty range. Note that both the damping and natural frequency of the main resonance are affected. Use feedback to build a closed-loop model T0 that includes both the tunable and uncertain elements. LL: Parametric SISO transfer function, 1 zeros, 1 poles, 1 occurrences. u: Analysis point, 1 channels, 1 occurrences. wn: Scalar parameter, 6 occurrences. zeta1: Scalar parameter, 1 occurrences. zeta2: Scalar parameter, 1 occurrences. Type "ss(T0)" to see the current value, "get(T0)" to see all properties, and "T0.Blocks" to interact with the blocks. 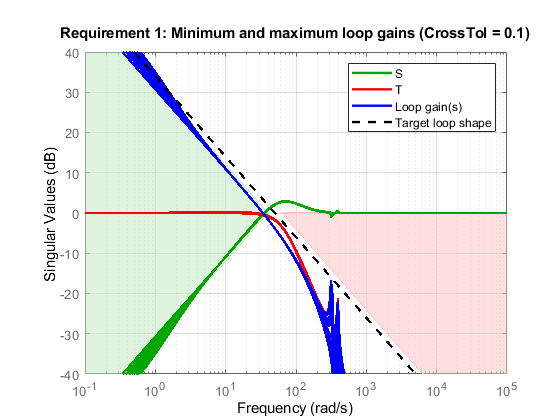 To prevent fast dynamics, we further limit the natural frequency of closed-loop poles. Now tune the controller parameters for the nominal plant subject to the three tuning goals. The final value indicates that all design objectives were nominally met and the closed-loop response looks good. How robust is this design? 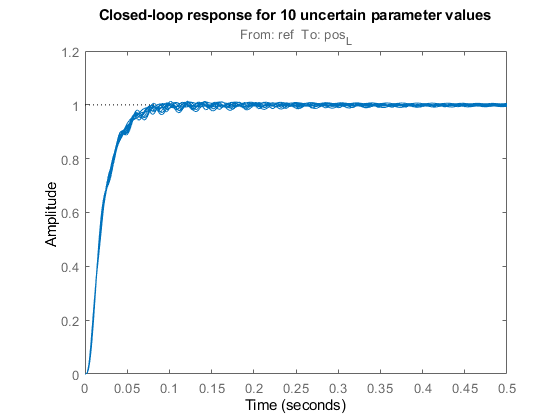 To find out, update the uncertain closed-loop model T0 with the nominally tuned controller parameters and plot the closed-loop step response for 10 random samples of the uncertain parameters. This plot reveals significant oscillations when moving away from the nominal values of . 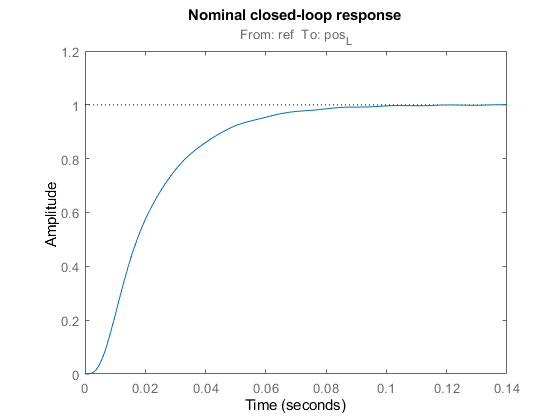 Next re-tune the controller using the uncertain closed-loop model T0 instead of its nominal value. This instructs systune to enforce the tuning goals over the entire uncertainty range. The achieved performance is a bit worse than for nominal tuning, which is expected given the additional robustness constraint. Compare performance with the nominal design. The robust design has more overshoot but is largely free of oscillations. Verify that the plant resonance is robustly attenuated. 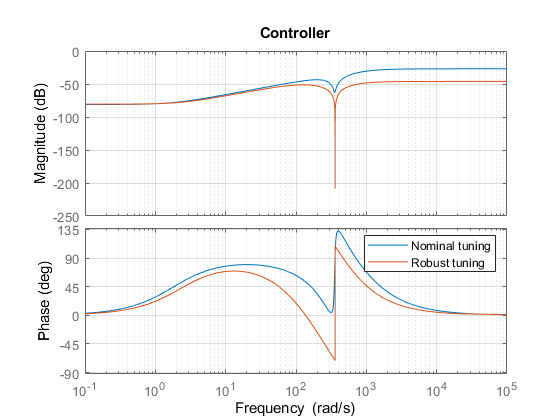 Finally, compare the nominal and robust controllers. Not surprisingly, the robust controller uses a wider and deeper notch to accommodate the damping and natural frequency variations in the plant resonance. Using systune's robust tuning capability, you can automatically position and calibrate the notch to best compensate for such variability. The fourth output argument of systune contains information about worst-case combinations of uncertain parameters. These combinations are listed in decreasing order of severity. 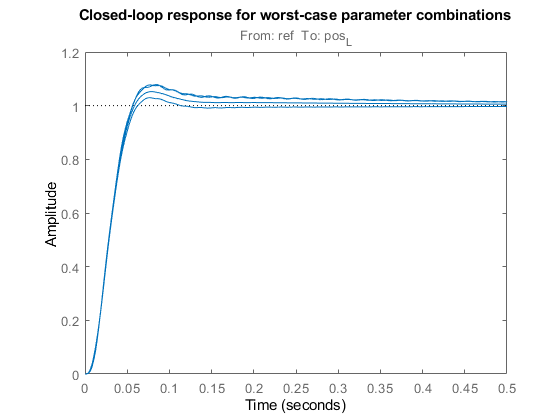 To analyze the worst-case responses, substitute these parameter values in the closed-loop model Trob.